NEW YORK, New York, January 21, 2014 (ENS) – The year 2013 tied with 2009 and 2006 for the seventh warmest year since recordkeeping began in 1880, continuing a long-term trend of rising global temperatures, NASA scientists said today. NASA’s Goddard Institute for Space Studies in New York, which analyzes global surface temperatures on an ongoing basis, released an updated report Tuesday on temperatures around the globe in 2013. It shows that with the exception of 1998, the 10 warmest years in the 134-year record have all have occurred since 2000, with 2010 and 2005 ranking as the warmest years on record. For those affected by the current storm system spreading heavy snow and strong winds into coastal New England and the Northeast, with temperatures 10 to 25 degrees below average and bitter wind chills, the NASA scientists emphasize that weather patterns always will cause fluctuations in average temperatures from year to year, but the continuing increases in greenhouse gas levels in Earth’s atmosphere are driving a long-term rise in global temperatures. “I believe the odds are that we can expect as a result of global warming to see more of this pattern of extreme cold in the mid latitudes and some extreme warm in the far north,” Holdren said. The average global temperature in 2013 was 58.3 degrees Fahrenheit (14.6 Celsius), which is 1.1 F (0.6 C) warmer than the mid-20th century baseline. The average global temperature has risen about 1.4 degrees F (0.8 C) since 1880, according to the new analysis. Exact rankings for individual years are sensitive to data inputs and analysis methods. Each successive year will not necessarily be warmer than the year before, but with the current level of greenhouse gas emissions, scientists expect each successive decade to be warmer than the previous. Carbon dioxide is the most prevalent greenhouse gas that traps heat and plays a major role in controlling changes to Earth’s climate. It occurs naturally and also is emitted by the burning of fossil fuels for energy. Driven by increasing emissions from human activities, the level of carbon dioxide in Earth’s atmosphere presently is higher than at any time in the last 800,000 years. The carbon dioxide level in the atmosphere was about 285 parts per million in 1880, the first year in the Goddard Institute’s temperature record. By 1960, the atmospheric carbon dioxide concentration, measured at the National Oceanic and Atmospheric Administration’s Mauna Loa Observatory in Hawaii, was about 315 parts per million. This measurement peaked last year at more than 400 parts per million. While the world experienced relatively warm temperatures in 2013, the continental United States experienced the 42nd warmest year on record, according to the GISS analysis. For other countries, such as Australia, 2013 was the hottest year on record. The Bureau of Meteorology of Australia said a significant heatwave affected much of the central and eastern interior of Australia over the New Year period in late 2013/early 2014. The heatwave was not as extensive or as prolonged as the heatwave of January 2013, and was not associated with destructive fires to the same extent, but was nevertheless “highly significant” with substantial areas having their hottest day on record. The intense heat wave and strong winds fueled an outbreak of hundreds of bushfires in South Australia and prompted evacuations of aboriginal communities. 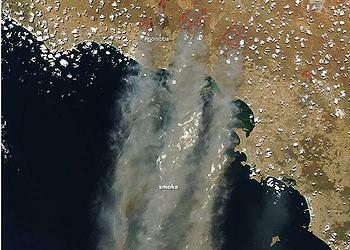 Argentina also experienced one of the worst heatwaves on record at the end of December 2013. 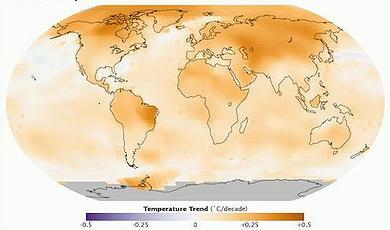 The temperature analysis produced at the Goddard Institute for Space Studies is compiled from weather data from more than 1,000 meteorological stations around the world, satellite observations of sea-surface temperature, and Antarctic research station measurements, taking into account station history and urban heat island effects. Software is used to calculate the difference between surface temperature in a given month and the average temperature for the same place from 1951 to 1980. This three-decade period functions as a baseline for the analysis. It has been 38 years since the recording of a year of cooler than average temperatures. The Goddard Institute for Space Studies’ temperature record is one of several global temperature analyses, along with those produced by the Met Office Hadley Centre in the United Kingdom and NOAA’s National Climatic Data Center in Asheville, North Carolina. NASA says these three primary records use slightly different methods, but overall, their trends show close agreement.